Vision-Adz Media is a Canadian mobile advertising company that is committed to being the dominant and most effective mobile advertising company in Canada. 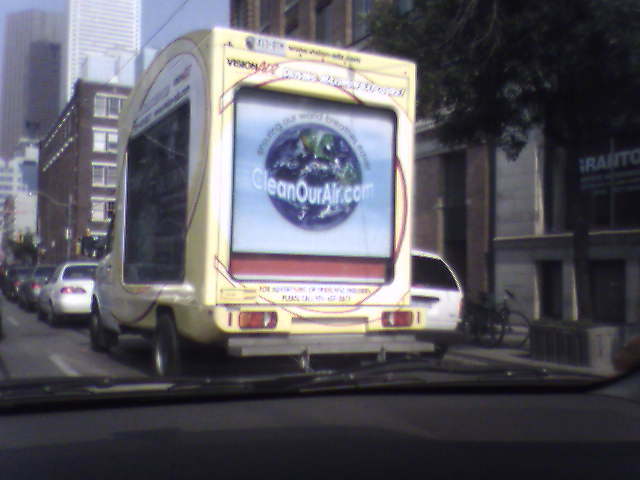 […] Being a mobile-based company, Vision-Adz’s president, Gary Prenevost is acutely aware of the negative impact to the environment of their vehicles, and in recognizing that they had to do something to offset this, Mr. Prenevost has personally funded the creation of the CleanOurAir.com website. Because Vision-Adz is in a unique position to create tremendous awareness about CleanOurAir.com, they have dedicated over $50,000 of advertising space to help launch this site. a) There’s a guy who runs a billboard truck company who feels bad about his business’ negative impact on the environment and genuinely wants to mitigate that—without, you know, actually reducing vehicle use. b) There’s a guy who runs a billboard truck company, and he knows he’s in an industry that will be one of the first casualties of our society’s emerging environmental consciousness, and he’s trying to pretend that “driving maximum exposure” isn’t mutually exclusive with a livable planet. Thankfully, Vision-Adz’s days are numbered. Last September, Councillor Joe Mihevc put forward to City Council a motion crafted by the TPSC that requests “the City Solicitor to develop a By-law banning the operation of vehicles used for the sole purpose of advertising, modelled after similar By-laws in Vancouver and Montreal” [PDF]. The motion was adopted at February’s meeting of the Licensing and Standards Committee, and City staff are currently drafting the by-law. We don’t doubt that Mr. Prenevost and his colleagues will be vigourously lobbying City Council for their right to miss the point entirely. Jonathan Goldsbie is a campaigner for the Toronto Public Space Committee, although all of the credit for the work on Billboard Trucks goes to TPSCer (and former Torontoist editor) Ron Nurwisah.